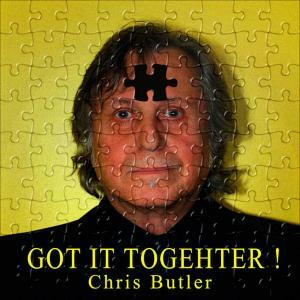 CD Review: Chris Butler's "Got It Togehter"
Although Chargin Falls-native musician, Chris Butler, is most known for his creating of the experimental new wave band The Waitresses, the Kent State University student (yes, he experienced the infamous Kent State shooting) was also actively involved in the highly influential 70s Kent/Akron/Cleveland music and art scene that practically invented the American new wave sound with such bands as Devo, Chrissie Hynde’s Jack Rabbit, the Bizarros, Pere Ubu, Pagans, and Butler’s own Waitresses, 15-60-75 (The Numbers Band) and Tin Huey. His first release since 2014’s Easy Life, Butler is a creative storyteller with a unique perspective, spinning tales of triumph, tragedy and humor through the often uniquely structured songs of Got It Togehter. However, something else that goes largely unnoticed is just how amazing a guitar player Butler is truly is, ripping and jamming over the top on his 12-string Rickenbacker, combining elements of rock, pop, progressive and psychedelia throughout. The opening “Physics” has a playful, simplistic, early-Kinks feel to it, with some swirling, psychedelic keyboard fills mixed in, before the mouthful “Songs For Guys" requires multiple listens to fully grasp the lyrics.... and not necessarily their full meaning, but simply the words themselves! However, the challenging lyrics are also surrounded by rocking guitars and often crashing drums that somehow tie it all together. For the record, the song is about having a crush on a female bass player. “New Enemy” starts off even-keeled enough, before building into a rocker with another blistering-cool guitar solo and sonic 6-string bass lines from Butler, while the light-acoustic “Summer Money,” a song about daydreaming of summer while enduring the Ohio winter, seemingly has an early Syd Barret-era Pink Floyd vibe to it. In contrast, “Late For Work” is a funky, groovy, song about wanting to skip work and stay home with your lady, with trippy synthesizer patterns and some funny lyrics laid over creative instrumentals. I’m not sure if Butler is a fan, but “Mommy Glow” reminds this reviewer of a low-tone Robyn Hitchcock song, while the Tin Huey (his former band) homage “Nicotine Weather” addresses the struggles of smoking through obscure Captain Beefheart-like lyrics and precise stop-and-go instrumentation.